For you to share your video online well, 4Easysoft Video to Flash Converter provides you more editing functions: adjust output video effect, crop video play region, add sorts of watermarks and capture video clips. All these functions can help you achieve the perfect effect. Convert video source file to several output formats only one time. 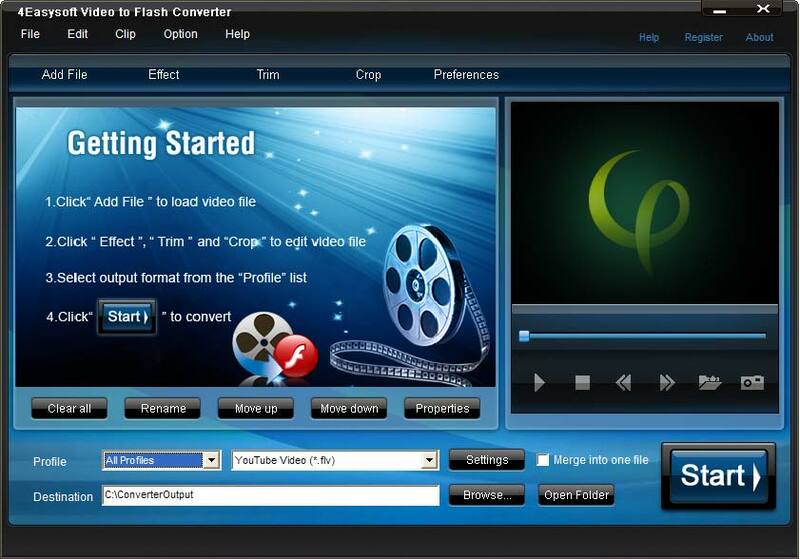 4Easysoft Video to Flash Converter allows you to get any time-length clips exactly you want. Crop the video play region. 4Easysoft Video to Flash Converter allows you to set the video Brightness, Contrast, Saturation. Checking Deinterlacing helps you to convert interlaced video to the progressive video, this function can optimize the video effect. With this product, you can choose subtitle and Audio track at your own will. With professional video encoding and decoding technique, 4Easysoft Video to Flash Converter brings you the advanced and high speed converting process. Select subtitle and audio track to your preference.